Inadvertent intrathecal use of OMNISCAN has caused convulsions, coma, sensory and motor neurologic deficits [see Warnings and Precautions (5.1)]. Screen patients for acute kidney injury and other conditions that may reduce renal function. For patients at risk for chronically reduced renal function (e.g., age > 60 years, hypertension or diabetes), estimate the glomerular filtration rate (GFR) through laboratory testing. Do not exceed the recommended OMNISCAN dose and allow a sufficient period of time for elimination of the drug from the body prior to any readministration [see Warnings and Precautions (5.2)]. These highlights do not include all the information needed to use OMNISCAN safely and effectively. See full prescribing information for OMNISCAN. Inadvertent intrathecal use of OMNISCAN has caused convulsions, coma, sensory and motor neurologic deficits (5.1). Screen patients for acute kidney injury and other conditions that may reduce renal function. For patients at risk for chronically reduced renal function (e.g., age > 60 years, hypertension or diabetes), estimate the glomerular filtration rate (GFR) through laboratory testing (5.2). Patients with chronic, severe kidney disease (GFR < 30 mL/min/1.73m2) or acute kidney injury (4). Nephrogenic Systemic Fibrosis (NSF) has occurred in patients with impaired elimination of GBCAs. Higher than recommended dosing or repeat dosing appears to increase the risk (5.2). Anaphylactoid and other serious hypersensitivity reactions including fatal reactions have occurred particularly in patients with history of allergy or drug reactions. Monitor patients closely for need of emergency cardiorespiratory support (5.3). 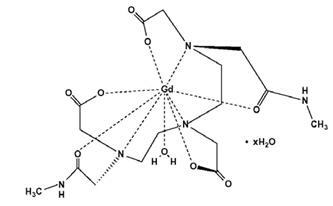 Gadolinium is retained for months or years in brain, bone, and other organs. (5.4). Acute renal failure has occurred in patients with preexisting renal insufficiency. Use the lowest necessary dose of OMNISCAN and evaluate renal function in these patients (5.5). To report SUSPECTED ADVERSE REACTIONS, contact GE Healthcare at 1-800-654-0118 or FDA at 1-800-FDA-1088 or www.fda.gov/medwatch. Pregnancy: Use only if imaging is essential during pregnancy and cannot be delayed (8.1). OMNISCAN is a gadolinium-based contrast agent indicated for intravenous use in MRI to facilitate the visualization of lesions with abnormal vascularity within the thoracic (noncardiac), abdominal, pelvic cavities, and the retroperitoneal space [see Clinical Studies (14.2)]. Adults: The recommended dose of OMNISCAN is 0.2 mL/kg (0.1 mmol/kg) administered as a bolus intravenous injection. Inspect OMNISCAN visually for particulate matter and discoloration before administration, whenever solution and container permit. Do not use the solution if it is discolored or particulate matter is present. To ensure complete delivery of the desired volume of contrast medium, follow the injection of OMNISCAN with a 5 mL flush of 0.9% sodium chloride, as provided in the Prefill Plus needle-free system. Complete the imaging procedure within 1 hour of administration of OMNISCAN. Once the closure is penetrated, keep the Pharmacy Bulk Package container in the aseptic area and at room temperature (do not exceed 30ºC). Gadolinium-based contrast agents (GBCAs) increase the risk for nephrogenic systemic fibrosis (NSF) among patients with impaired elimination of the drugs. Avoid use of GBCAs among these patients unless the diagnostic information is essential and not available with non-contrast enhanced MRI or other modalities. The GBCA-associated NSF risk appears highest for patients with chronic, severe kidney disease (GFR < 30 mL/min/1.73m2) as well as patients with acute kidney injury. Do not administer OMNISCAN to these patients. The risk appears lower for patients with chronic, moderate kidney disease (GFR 30-59 mL/min/1.73m2) and little, if any, for patients with chronic, mild kidney disease (GFR 60-89 mL/min/1.73m2). NSF may result in fatal or debilitating fibrosis affecting the skin, muscle and internal organs. Report any diagnosis of NSF following OMNISCAN administration to GE Healthcare (1-800-654-0118) or FDA (1-800-FDA-1088 or www.fda.gov/medwatch). Among the factors that may increase the risk for NSF are repeated or higher than recommended doses of a GBCA and the degree of renal impairment at the time of exposure. Record the specific GBCA and the dose administered to a patient. When administering a GBCA, do not exceed the recommended dose and allow a sufficient period of time for elimination of the agent prior to any readministration [see Boxed Warning, Contraindications (4), Clinical Pharmacology (12.2) and Dosage and Administration (2)]. Anaphylactoid and anaphylactic reactions, with cardiovascular, respiratory and/or cutaneous manifestations, resulting in death have occurred. Personnel trained in resuscitation techniques and resuscitation equipment should be present prior to OMNISCAN administration. If a hypersensitivity reaction occurs, stop OMNISCAN Injection and immediately begin appropriate therapy. Observe patients closely, particularly those with a history of drug reactions, asthma, allergy or other hypersensitivity disorders, during and up to several hours after OMNISCAN Injection. Consequences of gadolinium retention in the brain have not been established. Pathologic and clinical consequences of GBCA administration and retention in skin and other organs have been established in patients with impaired renal function [see Warnings and Precautions (5.2)]. There are rare reports of pathologic skin changes in patients with normal renal function. Adverse events involving multiple organ systems have been reported in patients with normal renal function without an established causal link to gadolinium retention [see Adverse Reactions (6.3)]. While clinical consequences of gadolinium retention have not been established in patients with normal renal function, certain patients might be at higher risk. These include patients requiring multiple lifetime doses, pregnant and pediatric patients [see Use in Specific Populations (8.1, 8.4)], and patients with inflammatory conditions. Consider the retention characteristics of the agent when choosing a GBCA for these patients. Minimize repetitive GBCA imaging studies, particularly closely spaced studies when possible. In patients with renal insufficiency, acute renal failure requiring dialysis or worsening renal function have occurred, mostly within 48 hours of OMNISCAN Injection. The risk of renal failure may increase with increasing dose of gadolinium contrast. Use the lowest necessary dose of contrast and evaluate renal function in patients with renal insufficiency. Acute renal failure was observed in < 1% of patients in OMNISCAN clinical studies [see Adverse Reactions (6)]. OMNISCAN is cleared by glomerular filtration. Hemodialysis also enhances OMNISCAN clearance [see Use in Specific Populations (8.5, 8.6)]. Paramagnetic contrast agents such as OMNISCAN might impair the visualization of lesions which are seen on the non-contrast MRI. This may be due to effects of the paramagnetic contrast agent, or imaging parameters. Exercise caution when OMNISCAN MRI scans are interpreted in the absence of a companion non-contrast MRI. In clinical studies 1160 patients were exposed to OMNISCAN. The most frequent adverse reactions were nausea, headache, and dizziness that occurred in 3% or less of the patients. The majority of these reactions were of mild to moderate intensity. Central and Peripheral Nervous System Disorders: Convulsions including grand mal, ataxia, abnormal coordination, paresthesia, tremor, aggravated multiple sclerosis (characterized by sensory and motor disturbances), aggravated migraine. Nervous System Disorders: Inadvertent intrathecal use causes convulsions, coma, paresthesia, paresis. Convulsions have also been reported with intravenous use in patients with and without a history of convulsions or brain lesions. General Disorders: Nephrogenic Systemic Fibrosis (NSF) [see Warnings and Precautions (5.2)]. Adverse events with variable onset and duration have been reported after GBCA administration [see Warnings and Precautions (5.4)]. These include fatigue, asthenia, pain syndromes, and heterogeneous clusters of symptoms in the neurological, cutaneous, and musculoskeletal systems. Renal and Urinary System Disorders: In patients with pre-existing renal insufficiency: acute renal failure, renal impairment, blood creatinine increased [see Warnings and Precautions (5.5)]. GBCAs cross the placenta and result in fetal exposure and gadolinium retention. The human data on the association between GBCAs and adverse fetal outcomes are limited and inconclusive. Because of the potential risks of gadolinium to the fetus, use OMNISCAN only if imaging is essential during pregnancy and cannot be delayed. OMNISCAN has been shown to have an adverse effect on embryo-fetal development in rabbits at dosages as low as 0.5 mmol/kg/day for 13 days during gestation (approximately 0.6 times the human dose based on a body surface area comparison). These adverse effects are observed as an increased incidence of flexed appendages and skeletal malformations which may be due to maternal toxicity since the body weight of the dams was reduced in response to OMNISCAN administration during pregnancy. In rat studies, fetal abnormalities were not observed at doses up to 2.5 mmol/kg/day for 10 days during gestation (1.3 times the maximum human dose based on a body surface area comparison); however, maternal toxicity was not achieved in these studies and a definitive conclusion about teratogenicity in rats at doses above 2.5 mmol/kg/day cannot be made. In clinical studies of OMNISCAN, 243 patients were between 65 and 80 years of age while 15 were over 80. No overall differences in safety or effectiveness were observed between these patients and younger patients. Other reported clinical experience has not identified differences in response between the elderly and younger patients, but greater sensitivity in the elderly cannot be ruled out. In general, dose selection for an elderly patient should be cautious, usually starting at the low end of the dosing range, reflecting the greater frequency of decreased hepatic, renal or cardiac function, and of concomitant disease or other drug therapy. OMNISCAN is excreted by the kidney, and the risk of toxic reactions to OMNISCAN may be greater in patients with impaired renal function [see Warnings and Precautions (5.4)]. Because elderly patients are more likely to have decreased renal function, select dose carefully and consider assessment of renal function before OMNISCAN use. Dose adjustments in renal or hepatic impairment have not been studied. Caution should be exercised in patients with impaired renal insufficiency [see Warnings and Precautions (5.2, 5.5)]. By increasing the relaxation rate, OMNISCAN decreases both the T1 and T2 relaxation times in tissues where it is distributed. At clinical doses, the effect is primarily on the T1 relaxation time, and produces an increase in signal intensity. Disruption of the blood-brain barrier or abnormal vascularity allows accumulation of OMNISCAN in lesions such as neoplasms, abscesses, and subacute infarcts. The pharmacokinetic parameters of OMNISCAN in various lesions are not known. The pharmacokinetics of intravenously administered gadodiamide in normal subjects conforms to an open, two-compartment model with mean distribution and elimination half-lives (reported as mean ± SD) of 3.7 ± 2.7 minutes and 77.8 ± 16 minutes, respectively. Gadodiamide is eliminated primarily in the urine with 95.4 ± 5.5% (mean ± SD) of the administered dose eliminated by 24 hours. The renal and plasma clearance rates of gadodiamide are nearly identical (1.7 and 1.8 mL/min/kg, respectively), and are similar to that of substances excreted primarily by glomerular filtration. The volume of distribution of gadodiamide (200 ± 61 mL/kg) is equivalent to that of extracellular water. Gadodiamide does not bind to human serum proteins in vitro. Following GBCA administration, gadolinium is present for months or years in brain, bone, skin, and other organs [see Warnings and Precautions (5.4)]. Pharmacokinetic and pharmacodynamic studies have not been systematically conducted to determine the optimal dose and imaging time in patients with abnormal renal function or renal failure, in the elderly, or in pediatric patients with immature renal function. Long term animal studies have not been performed to evaluate the carcinogenic potential of gadodiamide. The results of the following genotoxicity assays were negative: in vitro bacterial reverse mutation assay, in vitro Chinese Hamster Ovary (CHO)/Hypoxanthine Guanine Phosphoribosyl Transferase (HGPT) forward mutation assay, in vitro CHO chromosome aberration assay, and the in vivo mouse micronucleus assay at intravenous doses of 27 mmol/kg (approximately 7 times the maximum human dose based on a body surface area comparison). Impairment of male or female fertility was not observed in rats after intravenous administration three times per week at the maximum dose tested of 1.0 mmol/kg (approximately 0.5 times the maximum human dose based on a body surface area comparison). OMNISCAN (0.1 mmol/kg) contrast enhancement in CNS MRI was evident in a study of 439 adults. In a study of sequential dosing, 57 adults received OMNISCAN 0.1 mmol/kg followed by 0.2 mmol/kg within 20 minutes (for cumulative dose of 0.3 mmol/kg). The MRIs were compared blindly. In 54/56 (96%) patients, OMNISCAN contrast enhancement was evident with both the 0.1 mmol/kg and cumulative 0.3 mmol/kg OMNISCAN doses relative to non-contrast MRI. In comparison to the non-contrast MRI, increased numbers of brain and spine lesions were noted in 42% of patients who received OMNISCAN at any dose. In comparisons of 0.1 mmol/kg versus 0.3 mmol/kg, the results were comparable in 25/56 (45%); in 1/56 (2%) OMNISCAN 0.1 mmol/kg dose provided more diagnostic value and in 30/56 (54%) the cumulative OMNISCAN 0.3 mmol/kg dose provided more diagnostic value. Protect OMNISCAN from strong daylight and direct exposure to sunlight. Do not freeze. Freezing can cause small cracks in the vials, which would compromise the sterility of the product. Do not use if the product is inadvertently frozen. have a history of renal and/or liver disease, convulsions, asthma or allergic respiratory disorders, or recent administration of gadolinium-based contrast. Instruct the patients to contact their physician if they develop signs or symptoms of NSF following OMNISCAN administration such as burning, itching, swelling, scaling, hardening and tightening of the skin; red or dark patches on the skin; stiffness in joints with trouble moving, bending or straightening the arms, hands, legs or feet; pain deep in the hip bones or ribs; or muscle weakness. Advise patients that gadolinium is retained for months or years in brain, bone, skin, and other organs in patients with normal renal function. The clinical consequences of retention are unknown. Retention depends on multiple factors and is greater following administration of linear GBCAs than following administration of macrocyclic GBCAs [see Warnings and Precautions (5.4)]. Distributed by GE Healthcare Inc. Marlborough, MA 01752 U.S.A.
OMNISCAN is a trademark of General Electric Company or one of its subsidiaries. OMNISCAN is a prescription medicine called a gadolinium-based contrast agent (GBCA). OMNISCAN, like other GBCA medicines, is used with a magnetic resonance imaging (MRI) scanner. An MRI exam with a GBCA, including OMNISCAN, helps your doctor to see problems better than an MRI exam without a GBCA. What is the most important information I should know about OMNISCAN? OMNISCAN contains a metal called gadolinium. Small amounts of gadolinium can stay in your body including the brain, bones, skin and other parts of your body for a long time (several months to years). It is not known how gadolinium may affect you, so far, studies have not found harmful effects in patients with normal kidneys. Some people with kidney problems who get gadolinium medicines can develop a condition with severe thickening of the skin, muscles and other organs in the body (nephrogenic systemic fibrosis). Your healthcare provider should screen you to see how well your kidneys are working before you receive OMNISCAN. Do not receive OMNISCAN if you have had a severe allergic reaction to OMNISCAN. What are the possible side effects of OMNISCAN? See "What is the most important information I should know about OMNISCAN?" Allergic reactions. OMNISCAN can cause allergic reactions that can sometimes be serious. Your healthcare provider will monitor you closely for symptoms of an allergic reaction. The most common side effects of OMNISCAN include: nausea, headache, and dizziness. These are not all the possible side effects of OMNISCAN. General information about the safe and effective use of OMNISCAN. Medicines are sometimes prescribed for purposes other than those listed in a Medication Guide. You can ask your healthcare provider for information about OMNISCAN that is written for health professionals. What are the ingredients in OMNISCAN? OMNISCAN is a trademark of General Electric Company or one of its subsidiaries. GE and the GE Monogram are trademarks of General Electric Company. For more information, go to www.GEHealthcare.com or call 1-800-654-0118.